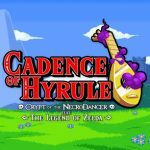 Following the surprise reveal of Cadence of Hyrule, the Zelda/Crypt of the Necrodancer crossover, we have a few new details on the game. We also have new official artwork, featuring Link, Zelda and Cadence. These were all visible in the trailer, but now you can see them all in high resolution below. ZUCast: Musical Easter Eggs, Hyrule, and ProtonJon!